Following 2005’s Hurricane Katrina, Congress required FEMA to establish contracts for goods and services in advance to enable quick and effective mobilization of resources in the aftermath of a disaster. 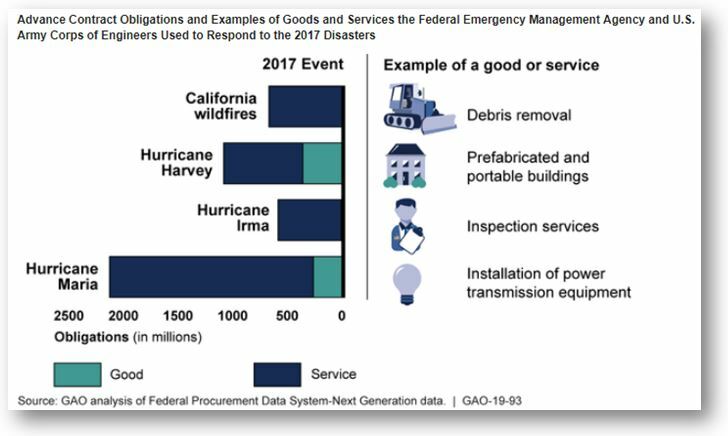 As a result, the Federal Emergency Management Office (FEMA) and the Army Corps of Engineers used “advance contracts” for $4.5 billion in goods and services after Hurricanes Harvey, Irma, and Maria, and the California fires of 2017. But in new audit report just released, the Government Accountability Office (GAO) found that FEMA’s guidance on the use of these types of contracts is unclear, and that inconsistent information from FEMA could impair its efforts to help state and local governments use advance contracts. FEMA also did not always provide complete information in its reports to congressional committees. Specifically, GAO found 29 advance contract actions that were not included in recent reports due to shortcomings in FEMA’s reporting methodology, limiting visibility into its disaster contract spending. FEMA identified challenges with advance contracts in 2017, including federal coordination with states and localities on their use. FEMA is required to coordinate with states and localities and encourage them to establish their own advance contracts with vendors. However, GAO found inconsistencies in that coordination and the information FEMA uses to coordinate with states and localities on advance contracts. Without consistent information and coordination with FEMA, states and localities may not have the tools needed to establish their own advance contracts for critical goods and services and quickly respond to future disasters. In its new report, GAO made nine recommendations to FEMA, including that it update its strategy and guidance to clarify the use of advance contracts, improve the timeliness of its acquisition planning activities, revise its methodology for reporting disaster contracting actions to congressional committees, and provide more consistent guidance and information to contracting officers to coordinate with and encourage states and localities to establish advance contracts. FEMA concurred with GAO’s recommendations.